Born from a love of 'daily sweat', it is only in the past two years that Canadian brand Lululemon have really accelerated their growth in the UK market. With stores popping up around London in particular, what really drew me in to Lululemon wasn't just the amazing fitness clothes and accessories, but the loyal community they have created around their brand. From the free in-store classes (check out my reviews on the YogaBox, AcroYoga and bootcamp here) their most recent, and most exciting, venture was 'The Sweat Life' - a festival of fitness held at London's Tobacco Dock. 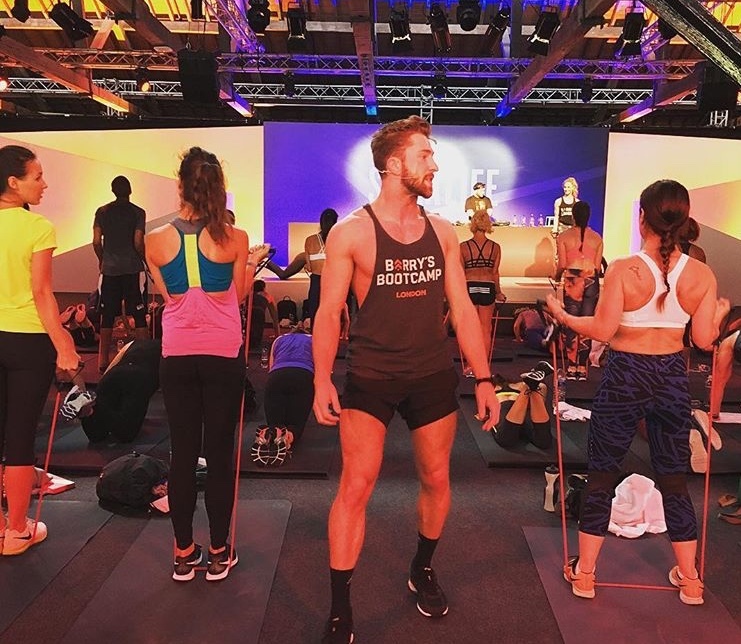 Dubbed 'The Glastonbury for the Active World' , it brought together London's top fitness studios (HeartCore, Barry's Bootcamp, X-tend Barre, Kobox, Psycle, Frame, and many more) under one roof for a day of fitness, mindfulness and fun.... and of course I was first in line to get my ticket! Steph and I, about to get sweaty! First class of the day, and boy did it kick me into shape for what was about to come! 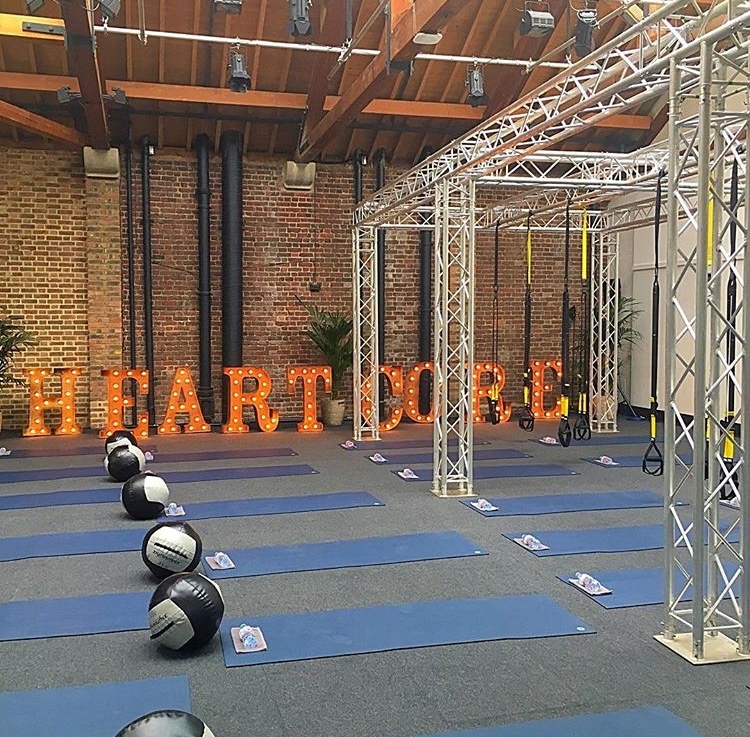 Having set up their space with a full rig out of TRX stations and mats, I first began on the TRX, where our instructor demonstrated the first sequence - a back to back combo of lunges, squats and jumping jacks to fire up the leg muscles. After a minute of each exercise, the class switched and the TRX squad moved on to the floor, where we continued the lower body workout with more squats, walk-outs, and throwing of the slam balls high into the air. Then it was back on to the TRX for a chest and triceps combo, followed by the floor routine, and repeated twice more to cover abs and shoulders. All mixed in with HIIT sessions on the floor, it was a killer....the cold towels we were handed at the end of the session were literally a godsend! I don't know who was happier - the man giving it to me, or me receiving it! Verdict: Definately one of my favourites out the whole day. Whilst I've tried out the Barre classes at Heartcore (read my review here), I will need to make another visit for the true TRX experience! This is one I actually tried with Lululemon around a year ago (read the review here), yet I enjoyed it so much I couldn't wait to come back for more. Anna was still as astounding as ever, flying up into advanced poses I never thought a human being was capable of! Whilst my friend Steph and I didn't feel quite brace enough to try the above, we were capable of a few more poses than we thought.... even if we were a bit wobbly! Verdict: A really fun take on a traditional yoga class - yet very tough! I'd definitely try it out again, but I can imagine to get to Anna's level it would take years of strength and flexibility training. But everyone has to start somewhere, right? Me and Steph - not quite as stable, but having fun getting there!! 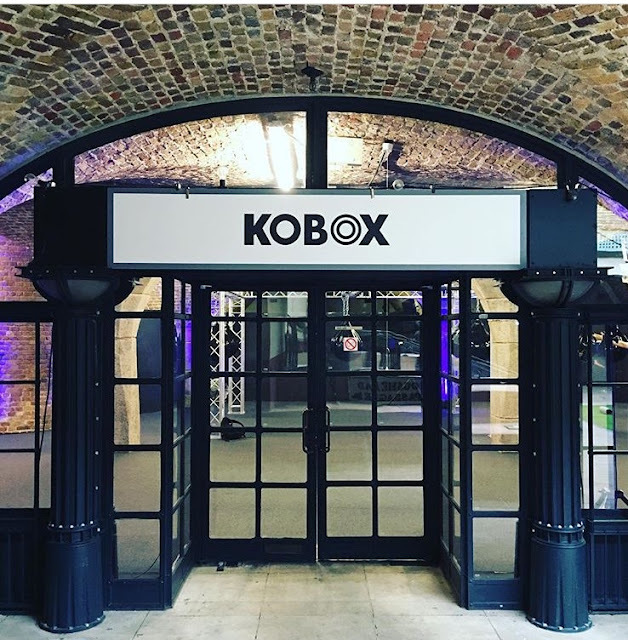 Having heard rave reviews of Kobox, as one of the only classes at the festival that I'd never tried before, this one was high on my list of priorities. With a similar set up to many of the classes there, half of us started on the punch bags, the other half on the floor, switching after each sequence. On the bags, we were shown six different types of punches and various routines combining them, which were shouted out by the instructor - e.g. "give me a 1,1,5,6" , and we'd repeat accordingly. On the floor, it was just as intense, doing a mix of burpees, lunges, squats, chest presses, tricep dips - you name it, we did it!! The killer - 1 legged burpees. That move shouldn't even exist! Verdict: I found this one a little harder to follow, as you really do need good co-ordination in order to whack out the number sequences on the bag.... I just wanted to punch the hell out of it, not follow a specific routine!! That said, on our final round we went into 'BeastMode' - which was literally just punching it out as though our life depended on it.... and after two minutes of that my whole body was exhausted, so I now fully appreciate the method behind the structure! Beastmode - punch it all out!! Connor Minney - our Barry's instructor took no prisoners! Ah, Barry's - my first venture into the realm of boutique fitness studios (read about it here), and without a doubt still my favourite. Held in the bigger 'Up-Dawg' studio, the class differed quite significantly from the traditional treadmill/floor combi you'd experience in their own studio, but by no means did that mean we were let off lightly! Again, split into two teams, I began using the resistance band, with the instructor referring to my team as "band"; whilst those behind us, performing bodyweight exercises simultaneously, were shouted out instructions under "bodyweight". After 15 minutes of hard resistance band work, we switched round and I was on body weight, followed by a sprint session against the resistance band, finishing with 15 minutes solid abs. Verdict: Arghhhhhhh - why did I leave the hardest class till last?! Having completed three 45 minutes classes already, by the time I reached Barry's my whole body was aching.... but at Barry's, there are no excuses! With the instructor encouraging and motivating us the whole way through, I really did blast out every little bit of energy I had left! The cool down... when we all fell to the floor! With Sweatlife not just being about the body, they also ran a range of workshops throughout the day, dedicated to mindful development. 'Soul Tonic' , 'The School of Life', 'Higher Selfie' and 'Vision and Goals setting', these workshops featured inspirational speakers from all walks of life - the perfect example of Lululemon's committment to both a healthy body AND mind. Verdict: Having always been very goal orientated, I went along to the Vision and Goal Setting workshop, half expecting to know most of what would be discussed. Nonetheless, I have to say, it was one of the most beneficial and profound talks I have ever experienced. Whilst I had always focused on more short/medium term goals, the idea of bringing in my overall 'vision' on where I see myself was completely knew to me - but made perfect sense. All these goals, little snippets of achievements, they have to lead to somewhere right? And whilst there are always going to be barriers to us getting where we want to be (time, money, knowledge), if you want it bad enough, you will find a way. A mantra I have always followed very closely - if you can see it, you can create it. This framework is intertwined within the Lululemon philosophy of self-empowerment, inner development and possibility, supporting their employees, shareholders and customers in creating a life that they love - because why would you have it any other way?! Ending the night on a high, the fun didn't stop when the sun went down... intact, it was just getting started, as we kicked off the evening with a Mass Yoga Rave held by Gloria Latham and legendary DJ Grandmaster Flash. Told by Gloria to "forget everything we ever believed about yoga" - this yoga rave was loud, in your face, energetic, chaotic....and SO MUCH FUN!!! Dancing away with fellow yogi's, we happily sweated out all our remaining energy to the upbeat music and flashing lights. Yep, this was yoga as I had never experienced before, but man, yogi's can party! And it's all gone.... hopefully to return next year?! And this, my friends, is why Lululemon is the successful brand it is. Fostering relationships with customers, athletes, fitness studios, it’s not just another store selling another product - it is a lifestyle, a community, and one I am proud to be a part of. Who doesn't love a toilet mirror snap? Especially in these ones - forget your usual festival port-a-loos, these ones come with a vanity pack!